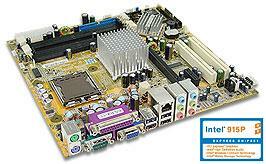 Taipei, Taiwan, 19 July 2004 – First International Computer, Inc (FIC), a world leader in the production of motherboards for over 20 years is proud to announce the introduction of two new motherboards based on the latest Intel® 915P Express Chipset. These new motherboards take advantage of the latest technology to enable consumers to harness the stability and performance offered by the Intel® 915P Express Chipset, and unleash the ultimate in graphics performance by fully utilizing contemporary PCI Express technology. These motherboards make use of the latest architecture, innovative technologies, and high bandwith interfaces to enable the convergence of digital entertainment, as well as enhance bandwidth-intensive consumer applications such as high end audio, video editing, and intensive gaming. In addition, two different boards are available to take advantage of flexible memory support with either dual channel DDR2 533/DDR2 400 or DDR400/DDR333 SDRAM memory. 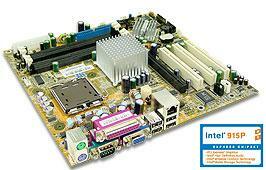 About the P4M-915PD1: The P4M-915PD1 performance motherboard is based on the new Intel® 915P Express chipset and is a perfect motherboard for consumer’s customers seeking 800MHz FSB support and optimized high performance with the latest Intel® Pentium 4 processors with the added flexibility of plugging in their choice of cutting edge PCI-Express video cards. Very rich in features this flexible motherboard sports 4 Dual-Channel DDR 400/333; up to 4GB, 1PCI-E x16, 3PCI, 4SATA support RAID 0, 1, embedded Realtek 10/100/1000 LAN, 8 channel Audio Codec & Intel® High Definition Audio, 1394×2, USB 2.0×8, and is the perfect motherboard for consumers that want to employ cost effective DDR 400/333 with a cutting edge PCI-Express graphics solution. About the P4M-915PD2: The P4M-915GD2 based on the high performance Intel® 915P Express chipset is a extremely flexible solution and delivers excellent Intel Pentium 4 with Hyper-Threading performance, coupled with the ability to take full advantage of DDR2 and PCI-Express technology. This motherboard possess 4 Dual-Channel DDR2 533/400; up to 4GB, 1PCI-E x16, 1 PCI-E x1, 2PCI, 4SATA support RAID 0, 1, embedded Intel 10/100/1000 LAN, 8 channel Audio Codec & Intel® High Definition Audio, 1394×2, USB 2.0×8, and is the ideal motherboard for consumers seeking to take advantage of the latest memory architecture as well as the performance benefits of PCI-Express graphics cards for the ultimate in video processing and next generation 3D gaming.